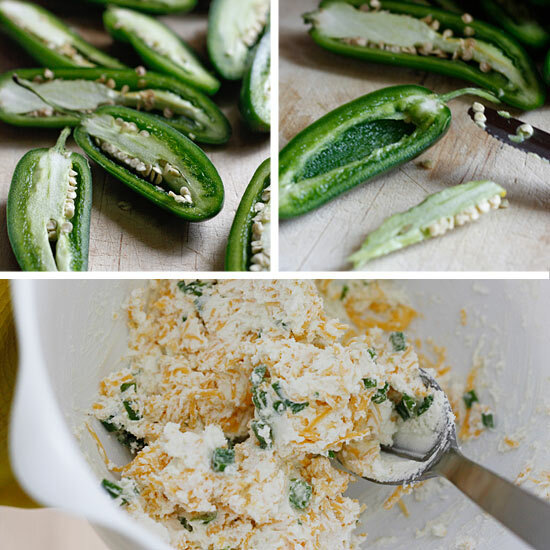 With Superbowl around the corner, these lightened up Jalapeño Poppers will make the perfect party appetizer. 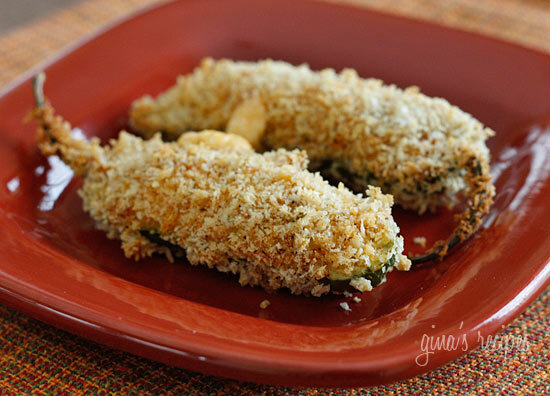 Jalapeño peppers stuffed with cheese, coated with seasoned panko, then baked not fried. You won’t miss the full fat version! This was another recipe request from one of my wonderful readers! You guys rock. I will never run out of ideas thanks to all your requests, just hope I can keep up with all of them. And speaking of awesome readers, thank you for nominating me for the Kitchn’s Top 10 Food Blog for 2011. Because of you, I made the Top 10. Wow, what an honor! I’ve been chosen among some really great food bloggers. Back to making these jalapeños, one important note when making these, wear gloves while handling the peppers. There is nothing worse than touching your eye or lip with jalapeño fingers, trust me, I’ve done it! Also if you have little kids, be careful to discard all the seeds if any fall on the floor. My one year old has a gift for finding every speck on the floor and putting it in her mouth. These can be made ahead of time, then baked when ready to serve. Enjoy! Wearing rubber gloves, cut peppers in half lengthwise and scoop out the seeds and membrane. Lightly spray the peppers with a little more oil spray. Bake in the oven for about 20-25 minutes, until golden and cheese oozes out. Remove from oven and serve immediately. Serve hot. *I used 1/4 cup more panko to make it easier to coat, then I was left with 1/4 cup which was tossed and not calculated in the nutritional info. I have to agree with Elizabeth – I should have made more! They were so easy to make and they were delicious. I cut the cheese in half, as I only had 6 jalapenos on hand, but still managed to use the full 1/2 cup of panko. I also used a whole egg. Thanks Gina! Yum! I just made these and the only negative was I should have made more! I adjusted the recipe a bit. I dipped them in flour first then egg whites then panko crumbs. I only added salt and pepper to the crumbs. For the filling I used 4 oz fat free cream cheese, 2 oz reduced fat cream cheese, 28 grams of a reduced fat mexican cheese blend, salt, pepper, chilli powder, garlic powder and fresh cilantro. I did all the math and caluclated 4 points for 6 poppers. I did have to bake them for about 45 minutes until they were brown enough. Thank you for posting the tip about wearing gloves! I just made these for dinner and they are amazing! I've been loving this blog-everything I've made I've loved, but these might be my favorite. Hot and melty perfection! 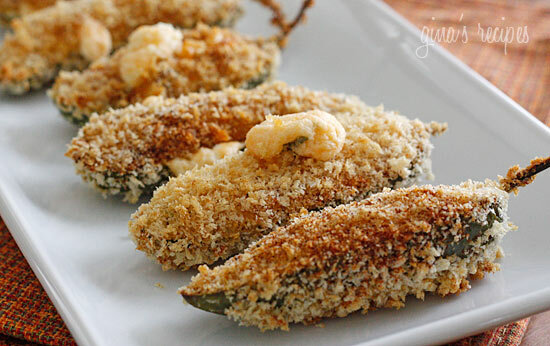 I LOVE jalapeno poppers! I knew I could count on you to have a skinny version! Thanks! I loved them. I pinned it and FB it. Good job. OMG Just finished making this and they are delicious!!!! I have them made and ready to pop into the oven during half-time! Thanks Gina! These are amazing! I've made them for four holiday parties this year and they are always the talk of the party. More people have asked me to send them this recipe than have ever requested recipes of the things I've made in the past. WARNING: WEAR GLOVES WHEN YOU MAKE THESE! The first time I made them, I did not wear gloves and my hands were in excruciating pain for 36 hours. adding a little cumin to the filling makes it even better! Mmm… I want these right now! Tried these and my family loved them. I used Italian bread crumbs. Do you think they would freeze well or would the coating get soggy? Thanks for a great recipe! 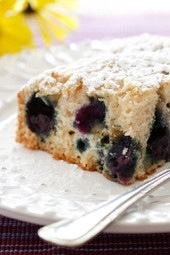 Recipe looks delish, def going to whip these up this weekend!! I'm just confused about the serving size. You wrote that the recipe yields 24 servings from 12 jalepenos. But than it says that 2 poppers are a serving size. Am I just interpreting this wrong? 12 Jalepenos cut in half makes 24 each. Serving size is 2. So 12 jalepenos is actually 12 servings. That's the way I read it anyway. 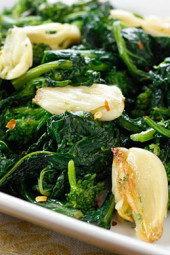 Could I substitute banana peppers in this recipe? I was careful to scrape out the seeds and membranes on these bad boys, but they were too hot to eat…and I like spice. Bummed out…wanted this recipe to be good. Thanks to a friend telling me about this blog I have made some great recipes with veggies straight from my backyard. Picked some fresh jalapenos this morning and ready to try this out!!! Just made this yesterday as part of my Father's Day meal for the hubby! There were AMAZING! Hardest part was stopping with 3 halfs! Thanks for a great recipe! Next time I think I would bake them longer to make the peppers more mild, or maybe par-boil them or something. Or maybe try this with small, colored bell peppers for a less spicy twist. Just made these they were really really good. I usually make the japo stuffed with cream cheese wrapped in bacon and bake. They are awesome but extremely fattening. So this was a great recipe to have to get kind of the similar taste thank you. Just made these tonight – awesome!! I heated equal amounts of blackberry jam & water to make a dipping sauce. Delish! Thank you! I made these tonight and was SO excited to try them as I am usually a total sucker for the fried fast food version of these. However, they were entirely too spicy for me. I'm not sure if that's normal or I just did something wrong? Maybe I will try again some other time. Great recipe!! I recently had fried banana peppers for the first time and have been looking for a baked version to make at home. Do you think this "breading" would work well on banana peppers, too? Hi Gina! Can I use the bottled jalapeno peppers or do they need to be fresh? I am wondering if the juice/water in the jar will affect your recipe? I did roll the filled peppers in flour before dipping in egg like other commenters suggested and the panko stuck pretty well. Overall, a delicious recipe. Thanks, Gina! made these today and they turned out good, however i severely under salted them and they tasted much better with some extra salt sprinkled on the top. next time im going to add salt and pepper to the cheese mixture as well. also i did not have enough panko, and thats that i added another 1/4 cup panko. even then 4 of my poppers had to go in without breading( they were still yummy that way). i think what happend is that i bought really big jalapenos, from your pictures yours are stuff and overflowing with cheese, while i barely had enough to stuff all 24 halves. all in all would definitely make again with smaller jalapenos and more seasoning. My daughter told me about your blog around two years ago. I've yet to try the buffalo chicken dip, but I will, soon. In the meantime, Ive made the buffalo wings, and I'm about to make them again today for the big game. GO BIG BLUE! How far in advance can you make these? I want them for Saturday night but want to make them Friday, should I dip them in breadcrumbs and refrigerate them? I'm so excited to try them!! My Hubby and I really enjoyed these! Thank you so much for making such an AWESOME version…. 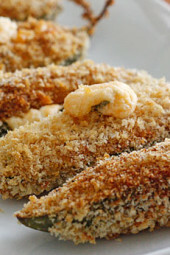 in the future my hubby and I are going to pre-cook the jalepenos to make sure they're a little softer… they didn't really have enough time to cook before the panko had turned brown.. might also help with having the panko stick to the bottom…. Thank you again! Wow. Made these last night for my sister and her husband, and we were all blown away. I used goat cheese instead of cream cheese (b/c that's what I had) and it was GREAT. I also forgot to spray them on top, but it didn't seem to matter. 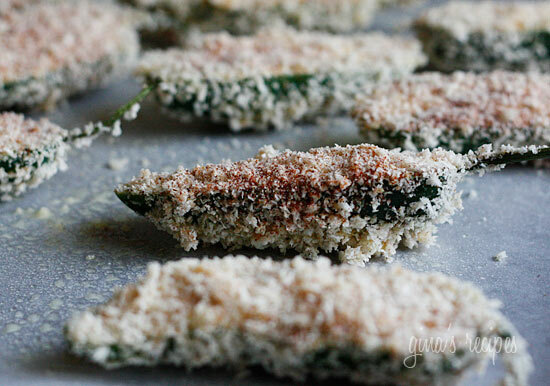 roll the bottom of the jalapeno in flour before the egg beaters and the panko sticks without a problem. might add like a tiny bit of calories/points but well worth not having to deal with the frustration. excellent recipe. added a can of lump crab to fancy them up. totally delish! I wish I had seen this before I made these. Mine sure didn't stick. Gina, I was wondering do you think I could make these and freeze them for later use? oh, I do adore poppers but they are sooooo dangerous! How did I ever live without Panko? thanks! I had a chance to try these tonight. My son has a gluten allergy so I attempted a GF version. 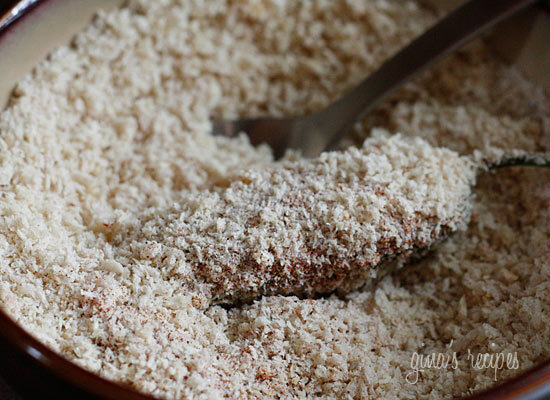 I replaced the Panko with crushed Rice Chex cereal and used a tablespoon of rice flour. Thanks for a great recipe that is easy to make GF. very tasty! shoot, one was especially hot! haha, yummy though. SO GOOD! I thought these would last for days….they MIGHT make it through two meals around here. Delish!!! These are AWESOME. My only complaint? They were gone too fast!! Next time I'm going to have to double or triple the recipe! I tried this recently and it came out very well. Enjoyed your recipe. Just like other said, even I had problem with the panko crumbs sticing to the peppers. but it tasted great. These were delicious and so easy! This receipe is terrific! I served it at my Superbowl party and no one even knew they were a healthy version. I have tried several of your reeipes and they have all been great but this is my favorite! Keep them coming!! I made these for a superbowl party yesterday and they were a hit! I doubled the recipe and used about 6 oz of cheese to make them extra cheesy. A little labor intensive, but it was worth it. these where amazing!! we used egg whites and preheated the baking pan… turned out awesome 🙂 thanks again! Made these to snack on during the Superbowl… they are amazing! Thanks! Just made these as part of our super bowl dinner. They were absolutely delicious!! Making these now…can't wait to try them! Also, I used a grapefruit spoon to scrape out the seeds/membranes. That worked like a charm! These look amazing!! I'm about to start making them. Thank you so much! Hi Gina, as always, thanks so much for all of your amazing recipes. These poppers look sooo good, I can't wait to try them. Hope you are having a good weekend. Could also substitute cream cheese and cheddar for the fat free version to save a few more calories. I added a couple piece of diced turkey bacon to some of mine 25 cal's per piece and added a ton of flavor! I wish I did, I had no problems with either one, but I do have problems from time to time, doing nothing different. Maybe it's the panko? I, too am in week 4 of WW. I am making them as we speak and I am having a problem with the Japanese panko crumbs and egg beaters. I am also making the zuch. sticks and the crumbs are not sticking to them either. Any thoughts? They both look delicious though!! I made these last night and they were sooo delicious and better than any fatty popper I've ever had! Thanks Gina! Great gluten free option! They actually sell crushed cornflakes in specialty stores. I recently bought them to play with. I've made a similar version a couple times now (using finely crushed corn flakes instead of panko). My boyfriend and I love them! They've ruined typical, fried poppers for me. These babies are far superior to the fatty, bland poppers usually found in restaurants. I just made these and they are awesome!! They taste and look like a very high quality popper. this recipe is AWESOME! i'm so excited to try it. I did an entry on jalapeno poppers and used your recipe (giving you credit and a link back, of course =D). also, i used the recipe builder on the WW online site and they actually said these a 1 PP per serving! This looks Amazing! I am only week 4 into Weight Watchers, and with super bowl this coming Sunday you saved me from over doing it! I can have a few of these guys and not feel guilty plus I know my husband will love them. Can't wait to try them! I must have gotten lucky! If you don't want them spicy, make sure you remove the membrane. I used egg beaters when I made them, and the crumbs didn't stick well to the bottom either. I think mine were Japanese "style" panko crumbs. These were really, really good, but much (much!) hotter than poppers I'd get out to eat. Would cooking them longer help cut down on the heat? Can't wait to try these out, they're officially on the superbowl menu! These look really good – YUM! I used egg beaters so I'm thinking maybe the egg beaters might be better than egg whites, I had no problems with the crumbs sticking. I used a spoon to help gently coat them, then gently placed them on the cookie sheet. I noticed not all panko crumbs in my supermarket looked the same. Some were more condensed while others looked fluffier. I wonder if it has something to do with the panko? I used real Japanese panko, not japanese "style" panko. Just guessing though! I only recently tried the high-fat version of these, and I was disappointed that they were too many points to justify. Thanks so much for this lighter version! I can't wait to give these a try! Mine are in the oven with five minutes to go. Can't wait to dig in! They smell delicious. The scallions in the mix totally make it (I had to sneak a taste). I'm LOL after reading these comments because my hands are also burning! Lesson learned ;o) Gina, I also had a hard time getting it to stick under the pepper–so I compensated by adding a bit more to the top. Any advice is welcomed. Thanks for sharing your fantastic recipes! Made these yesterday! They were delicious! I had the same problem with the panko not sticking to the bottom and I used egg beaters AND beat them a little bit..
any suggestions? Gina it looks like yours were evenly coated all over. I just made these…they are literally still in the oven. The only thing was the crumbs would not stick to the bare jalapeno (the underneath). I just noticed the recipe said "beaten" egg whites and we didn't beat them first….would that do it? Also would egg beaters work better than the whites for making the crumbs stick? Thanks! Hubby is very excited to try them! holy cow this looks amazing. motivation to get off my couch and go to the grocery store! Made these last night, AWESOME!!!! My husband liked them better than the greasy deep fried restaurant version! Making them for the Superbowl Party next weekend! Thanks Gina! Thank you for all of your hard work and AMAZING recipes, they truly help us all through our weight loss journey! Thank you. i love poppers, but not the fat. I'm going to try these asap. Yes, you can use breadcrumbs instead if you wish. 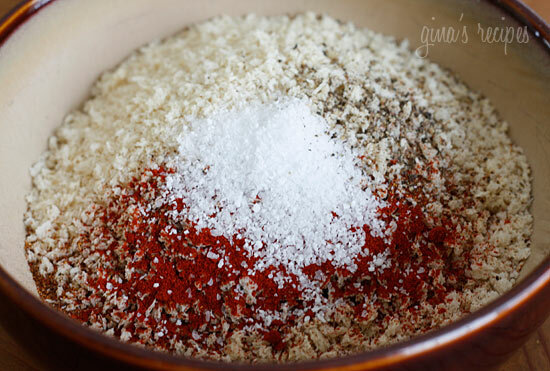 Can you use plain breadcrumbs instead of panko? where was this recipe when I had jalepenos coming out of my ears during the summer!?!!! mmmmm…will keep this one for this summer! 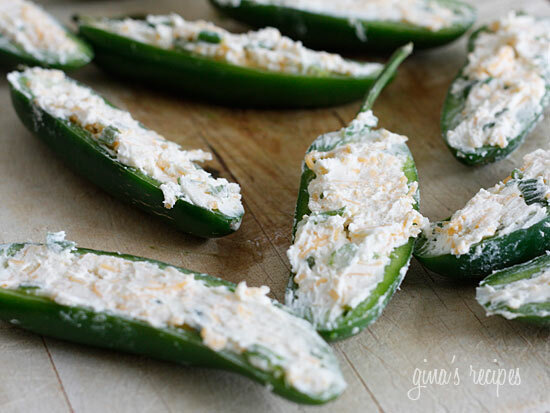 Oh yeah, another tip – if the cheese melting too fast for the jalapenos to cook, stuff the peppers and then freeze them before breading & baking them! 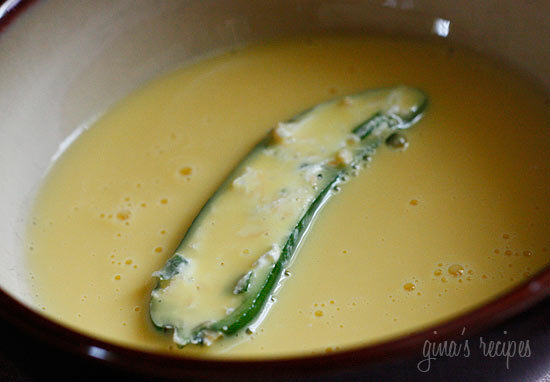 I have been making Jalapeno Poppers for 2 years now, and I love your idea of green onions in the cheese mix. I have found fat free Philadelphia cream cheese that, when mixed with the cheddar and melted, tastes like the light cream cheese with less calories and fat! I will be making these for sure! Have thoroughly enjoyed visiting your site. Love the layout of your blog AND the content. Wishing you the best! Can you say Super Bowl snacks???? Thanks, Gina. 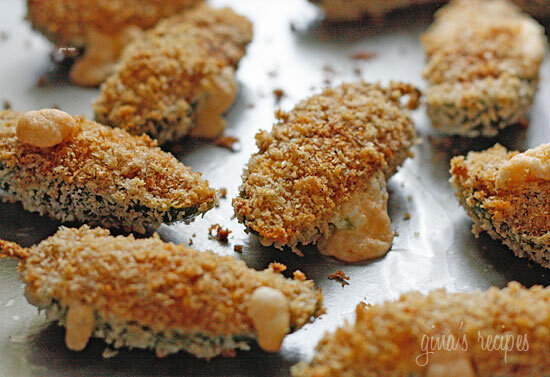 The hubby and I love jalapeno poppers!!! I can't wait to try these! We're going to plant an even larger pepper garden this year, and it seems these will be a great staple to use throughout the pepper season as well! Thanks! 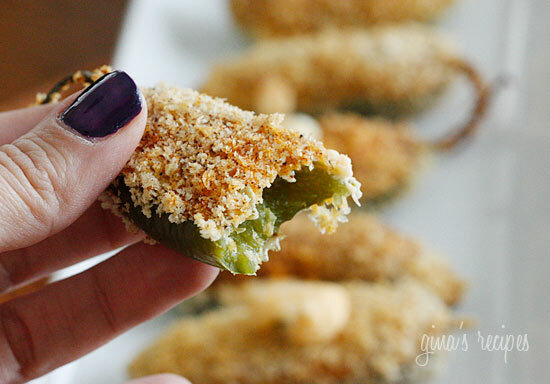 I love jalapeno poppers, but haven't had them in forever! Great recipe! Gina, I found your blog about a week ago. I have been referring people to your website like crazy! A ton of people that I have referred just LOVE it! I have a friend who tried out one of your recipes, and loved it! I have loved every recipe of yours that I have made! I have even listed a few of your recipe names (with links back to your page to get the recipe) on my blog! I call you a complete cook genius! Keep up the AMAZING work! WOW! Those look so good. I like the breading idea. Thanks for the post. Shannon, that's a tough one but we'll see! I love creamy polenta too! Angela, thanks about the nail polish! I am completely amazed that you managed to make these so low in points! Yum. Love the nail polish. I really have no idea what I would do without you Gina! I cook from your recipes at all week long and have never been disappointed. I actually discovered you before I started the plan but once I joined I couldn't do without your recipes. Thank you so much for all that you do. 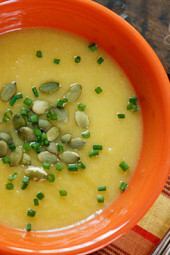 I am dying for a lightened up creamy polenta a la Gina. Pretty Please? Gina, congrats on being a finalist! When we were in Texas, a friend made these but mixed raspberry salsa in with the cream cheese. It was SO delicious! I think it would cut back on the fat in the cream cheese, too. Was the salsa in lieu of anything like the cheddar? I LOVE poppers. Great job at lightening them up!